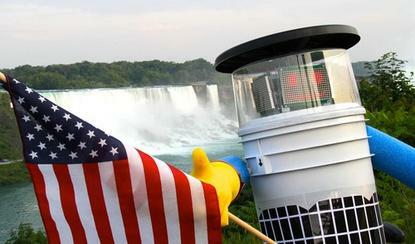 Canadian hitchhiking robot HitchBot poses in this promotional image distributed by Ryerson University for the robot's journey from Massachusetts to California. A robot that counted on the kindness of strangers to help it travel around the world has met a cruel fate in Philadelphia, barely three weeks into an attempt to hitch-hike across the U.S. Hitchbot, developed by robotics researchers at McMaster University in Hamilton, Ontario, had already hitch-hiked successfully across Canada and Germany, but U.S. residents turned out to be less welcoming, AP reports. After selling its smartphone activities to Microsoft, Nokia is slimming down a little more, with the sale of its Here mapping business to a consortium of German automobile manufacturers. Audi, BMW and Daimler bought Here in a deal valuing it at €2.8 billion (US$3.1 billion). The companies plan to run Here as an open and independent platform for cloud-based maps and other mobility services, accessible to customers from the automotive industry and other sectors. Spies and financial fraudsters have a lot in common these days, as they try to exfiltrate information unobserved. The tools to catch them are converging too, as a number of companies selling to the intelligence services are finding new customers in banks and hedge funds, the Wall Street Journal reports. It's taken them a year of crunching the data in the bitcoin blockchain, but Tokyo police have now arrested Mark Karpeles, the CEO of bankrupt bitcoin exchange MtGox. Karpeles, a French citizen, is suspected of accessing the company's computer systems and falsifying financial data, PCWorld reports. To help the nation plug holes in its computer systems and catch those responsible for exploiting them, the U.S. Federal Bureau of Investigation needs to plug some holes in its payroll. Over a third of the FBI's vacancies for computer scientists are going unfilled, The Register reports, citing a Department of Justice audit report that blames low pay and extensive background checks for the recruitment problem. Apple may be testing a new way to avoid returning calls: a version of its Siri digital assistant that can act as a receptionist and transcribe your calls. Business Insider has the details on the service, which it says may mean you need never listen to your voicemail again. The Google Voice service has offered a similar transcription function for years, but Siri is likely to offer tighter integration with Apple's mobile operating system and cloud services. Just days after a patch was issued for a major flaw in the BIND software for the Domain Name System, attacks on DNS servers around the world have begun, Computerworld reports. The attacks can crash a DNS server, making sites relying on it inaccessible until it is restarted. Drones are autonomous aircraft designed to fly freely without human intervention -- so attaching a power cable to one seems like a daft idea. But this, the Wall Street Journal reports, is how some companies plan to resolve two problems that plague the fledgling drone industry: limited battery life, and drones drifting out of site and out of control. U.S. businesses aren't the only ones wanting to keep drones on a tight leash: China's government wants to tighten its control on unmanned aircraft too. Chinese authorities are imposing export restrictions on drones able to fly for more than an hour, out of sight of their operators. The restrictions also affect supercomputing equipment, although the bar here is pretty low: A cluster of as few as five PlayStation 4 gaming consoles would be subject to an export ban, which affects devices capable of over 8T flops (floating-point operations per second). IDG.tv reviews the Ring video doorbell, which lets you answer the door on your smartphone -- even when you're not at home. Edward Snowden was far from the first to show us the extent of government surveillance. The Intercept has Duncan Campbell's account of how he has spent almost four decades fighting to uncover British government surveillance.